-sentence strips with words only. 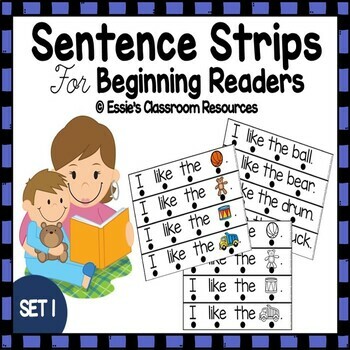 -Sentence strips with missing word that students can complete by using a dry erase marker. Simply print and cut apart the sentence strips. You can also laminate for durability. Use these as part of your learning center or with individual students who require intervention. Please leave feedback and also follow my store by clicking on the green star above. If you have any questions or querries about this product feel free to email me at esther_bobb@hotmail.com I will try to get back to you ASAP.